Nowy zestaw do waloryzacji modeli pojazdów bojowych, działających na północnoafrykańskim teatrze działań wojennych. Zestaw znajduje zastosowanie zarówno dla pojazdów Africa Korps jak i dla pojazdów sił sprzymierzonych. The vehicles based in North Africa, especially German ones, is a theme that is enjoyed by many a modeller. Although you can already find a set of African colours, that simulate dust, in our catalogue. 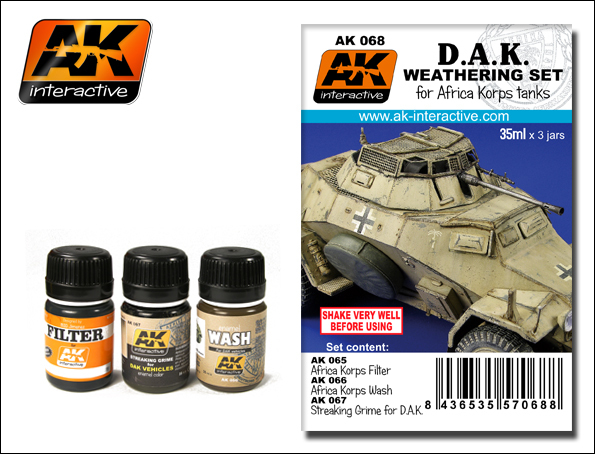 This totally new set has been designed for doing weathering effects on German vehicles based in North Africa, of course it perfectly acceptable to be used on Allied vehicles or even more modern examples. The set includes three different colours for doing washes, filters and streaking grime effects. Everything you need to do a basic weathering effect.